Sword of Fargoal has been ‘retro-gaming’ fan-favorite since it was first released in 1983 for the Commodore 64 computer. With the release of the iPhone version in 2009 came the introduction of a whole set of orchestral-style music, as composed and performed by Daniel Pemberton and several other wonderful musical artists. 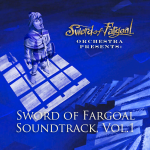 We are proud to release “Sword of Fargoal Soundtrack, Vol.1” for you to listen to, wherever you might happen to be, to enjoy as a soundtrack to your life. We’ve included 15 individual tracks for purchase, plus nine additional bonus tracks if you buy the whole album (for a total of 24 tracks). Orchestral score by Daniel Pemberton, Dustin Crenna, Julius Sneider, and in-game retro music & effects by Jeff McCord and Paul Pridham. Well, it came right down to the wire but in the end, you guys came through and pushed our campaign to fast-track Fargoal 2 over the finish line. We are so amazed and humbled by the outpouring of support and we can’t wait to get to work. We’ll have many more updates soon, but for now we have to collapse in a happy state of exhaustion. Also Jeff McCord is live on the air at KICKATHON. Check out the broadcast. First of all, we’ve made it beyond the half-way mark in funding! Please LIKE & share our Facebook link to help us get the word out! Secondly, we have this great announcement about some of our plans for “Sword of Fargoal: The Board Game” that you can read about in this Update on Kickstarter. And finally, we have added an exciting $1,000 “RETRO” LEVEL reward, which includes ten (10) Commodore 64 computers and 1541 disk drives for ten lucky supporters! “25 years after spending countless hours searching for the Sword of Fargoal on my C64 I found myself again marching into the perilous depths of Jeff McCord’s twisted dungeoncraft in the hopes of finally bringing home the fabled weapon. The re-imagining of the classic game by Jeff and Game Lead Paul Pridham was as inspired and addictive as his original creation, and both versions remain constant sources of fun for me on both the iPad and the iPhone. EDIT: October 4, 2012 we are close to reaching our half-way point with funding. However, there are less-than nine days left to reach the other half of our funding. We are delighted to have started off with a *bang* on our Kickstarter campaign launch today (September 13, 2012) at 3:01 pm. Within the first few hours we reached the $1,300 level, and appear to be going strong. Our hope is to raise the needed funds to complete the last 20% of our next game, “Sword of Fargoal 2,” plus if we are lucky, fly past the $50,000 base level and reach some of our fantastic Stretch Goals, including super secret “Project X” at the $140,000 level! You can view and support the Fargoal 2 Kickstarter campaign, which ends on October 13, 2012, by clicking here or on the link within the Kickstarter preview to the left! Sneak-preview “pre-announcement” about Fargoal 2 Kickstarter campaign! We know how important it is to everyone — ourselves included — to finish our year+ long efforts on “Sword of Fargoal 2.” We are resolved to do just that, and we have a plan that we think will help us successfully accomplish *all* of our goals for the completely rebuilt, new release of the game. Though this is not the ‘official’ announcement that will be to-come, we wanted to let you know *early on* that we will in fact be launching a “Fargoal 2” Kickstarter campaign as many of you have suggested!! As many of you know, we have been working on adding all the new dungeon level types, character classes, intelligent monster behaviors, treasures, traps, interface design changes, music tracks, etc. Plus there are completely new features — like “Action Cards” & side-quests — that we plan to put into the new game. “Sword of Fargoal” (and “Sword of Fargoal Legends”) were feats of gargantuan proportions already on their own (for a small, grass roots, three-person team). What we’ve discovered is that “Fargoal 2” has been many more times *bigger* for us to accomplish! At this point we are about 80% done. It is that last 20% that we know will be the hardest, and the portion we will be asking for help from our Kickstarter supporters and Fargoal fans. When we can fully announce the Kickstarter campaign and we know its specific timing, we will let you all know what fantastic rewards will be offered. Digital downloads of the game will, of course, be one of the base reward levels. At the highest level, for *one person only* we will be offering THE real-life, handcrafted “Sword of Fargoal” itself! Yes, you heard right!! (preview pictures of the Sword will be shown in the official announcement). Please stay tuned, and spread the word for people to look for our Kickstarter announcement coming soon. Thank you *all* for sticking with us, giving us inspiration and encouragement, and sometimes the ‘kick in the pants’ that we’ve needed as well. It has been a long, amazing, and sometimes perilous quest for us so far — but we think we can see the signs that we are about to reach the Sword Level soon, and are on the right path to getting “Sword of Fargoal 2” launched in all its glory for all to see!! Chillingo has just released Sword of Fargoal Legends version 1.8! This version breaks new ground because it is not only improved with new, better graphics, content, and dungeon fun, but it also is “universal,” meaning that it runs both on iPad and iPhone. For your viewing pleasure, we present 6 months of development & testing Sword of Fargoal for iPhone in 60 sec — Share it! The long-awaited iPad update for “Sword of Fargoal Legends” with full-HD graphics is now available for download on the iTunes App Store. Check out some of the new graphical changes when compared to the previous version!